'SPIROGRAPH' TOY: A simple and fascinating way to make a million marvellous patterns. Spirograph is useful to the artist and graphic designer both as a creative starting point and as an end in itself. Spirograph relief patterns have been successfully produced on copper sheet and other media. 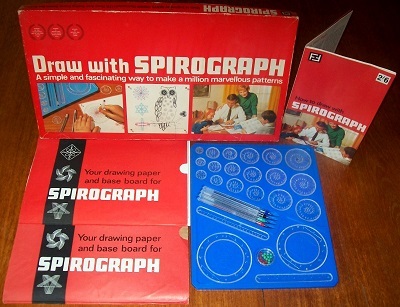 some idea of Spirograph's artistic potential is revealed by the work of the French artist, Dominique Roche, whose Spirograph Owl appears on the lid of the box. The multi-award winning toy is complete (except for the four expired biro pens) and in excellent condition throughout. Not only is every Spirograph wheel, ring, rack and pin included and in excellent condition, but this example even contains the original cardboard drawing base and special Spirograph . The substantial rule booklet is present and in brilliant condition. Awards: The Education Toy of the Year (UK); Design Idea of the Month (USA); and Artistic Toy Oscar (Paris).